Star Trek Into Darkness is certainly beautifully looking and provides a mostly, fun, amusing adventure. Unfortunately, the actual mechanics of the film as a whole provides an inconsistent, disapointing follow up to director J.J. Abrams' 2009 series reimagining. Into Darkness is full of entertaining scenes and compelling acting, but the story, execution, and its overall construction are hollow and severely underdeveloped. The first film had an easy, fun feel to it as we're introduced to younger versions of our heroes, each with their own journey, and a basic plot moving forward. 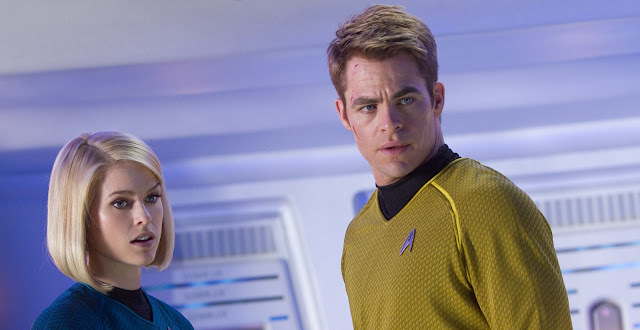 Chris Pine, Zachary Quinto, and Zoë Saldana still make very appealing versions of Kirk, Spock, and Uhura. However, Sulu (John Cho) and Chekhov (Anton Yelchin) are terribly underserved by the sequel's script left with little to do and none of their own motivations. Developed solidly the first time around, Karl Urban captures every note and steals his scenes but is used purely as comic relief and his special bond with Kirk is largely abandoned. The sequel has a wildly convoluted and messy plot where significant character relationships are shoehorned in or barely explained. It intentionally hides things to trick the viewer (for no real reason) and fails. The film's villain played by Benedict Cumberbatch is introduced and established in a totally underwhelming, forgettable way. He relies heavily on our own perceptions of his villainy and takes away valuable time from the rest of the cast. We know he's an evil terrorist because so many character say so. His actual motivations, backstory, and role in the larger Star Trek mythology are woefully ineffectively portrayed in the actual film as we rely on clunky exposition. Abrams and writers/producers Roberto Orci, Alex Kurtzman, and Damon Lindelof make interesting but lazy parallels to real life issues of terrorism and war crimes with Klingons used as temporary, throwaway placeholder villains in a weak 9/11 allegory. While not a fan and without any attachment to previous Star Trek incarnations, I still couldn't help feeling cheated by its maddening pace and varied tone. As I vaguely recognized the references and nods to the original series and other films, they felt like cheap retreads done with more money, special effects, and lens flares while being far less genuine or effective. I can't remember enjoying a film in the moment this much yet still managing to leave the theatre so hollow and thoroughly unsatisfied. Abrams shows his mastery of visuals and working with actors but abandons his roots as a dramatic storyteller and gift for crafting adventure through compelling mystery. This is why Star Trek Into Darkness feels so silly, almost completely disposable, and like an oddly violent mishmash of old Trek ideas. Despite big effects, flashy action, and intergalactic space travel, the film feels small, even for popcorn fare, as it lacks much of any substance.